JULY 9– Spend Your Saturday With Us! 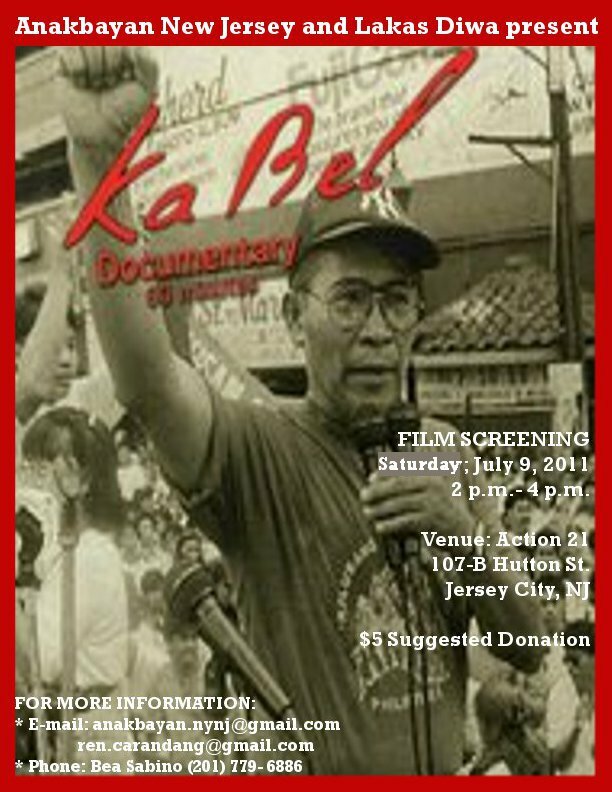 What: A 60-minute documentary about the life and struggle of Ka Bel. Crispin “Ka Bel” Beltran was a prominent labor leader in the Philippines, well-loved and respected by the masses. His life and struggle were dedicated to champion the rights and welfare of the oppressed working people. He served as chairperson of Kilusang Mayo Uno (May 1st Movement), and later as a congressman, representing the Anakpawis (Toiling Masses) Party.We hope you could join us in celebrating Ka Bel, a tried and true working class hero. **** DATE AND VENUE CHANGED***** Details below. What: A fundraiser party for Anakbayan’s Summer Exposure Program 2011., which will send 4 of our members to the Philippines for 3 weeks this month to integrate with, and learn from, the basic masses. ← Anakbayan Needs Your Support!